Last week I was lucky enough to spend five days co-leading a tour with the incredible Carlos Bethancourt in Darien Province, Panama with Sunrise Birding. Though raptors were not our specific focus at Canopy Camp we did have plenty of great encounters with them including one with perhaps the most sought after raptor in the world, a Harpy Eagle. Our first day was taken up with a drive from Panama City down to the Darien where we encountered our first raptors of the trip. Our first was a beautiful little adult Double-toothed Kite. Though superficially they look somewhat like an accipiter these neat birds generally hunt lizards and insects by following troops of monkeys, picking off creatures that are escaping the commotion of a roving group of primates. As the sun began to break out, on this thus far cloudy day, so small groups of Swallow-tailed Kites began to drift up from the surrounding forest before kettling up and making their way southwards on their migration. Swallow-tailed Kites are resident in Panama but these kettling groups of up to thirty birds were definitely migrants. Also migrating in smaller numbers were groups of Plumbeous Kites. These migratory kites are very akin to Mississippi Kites, but with much fancier rufous and black primaries. 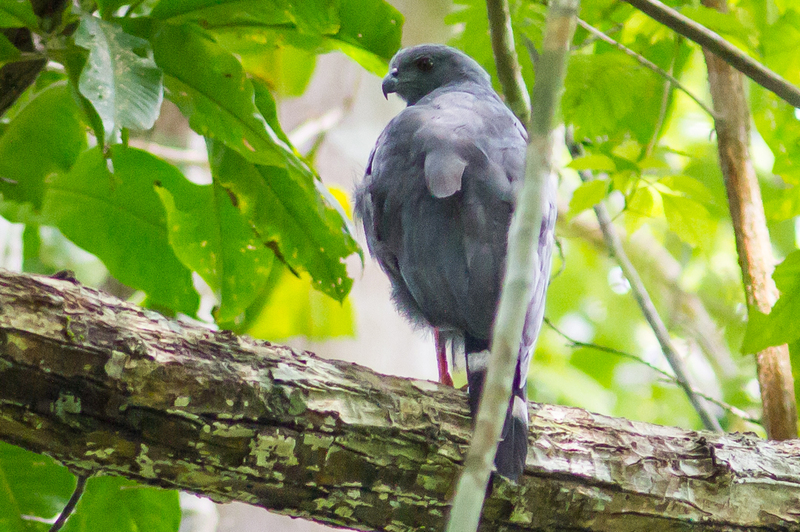 Plumbeous Kites only get as far north as Mexico to breed but do cross paths with Mississippi Kites during migration and in winter. Our day ended at the Canopy Camp in Darien, where we were greeted on arrival by a flyover Zone-tailed Hawk. After waking to the sound of calling Mottled and Crested Owls, the morning of day two was spent mainly around the Canopy Camp itself. A Roadside Hawk or two are often patrolling the property and early morning a Savanna Hawk sailed over. As the morning warmed up, so did the raptor activity. Black and Turkey Vultures are abundant almost everywhere in Panama, but it’s foolish not to look at groups of them closely as there are often other similarly colored raptors hiding among them. In among the clouds of mainly Black Vultures we soon had Common Black Hawk, Zone-tailed Hawk and both adult and juvenile King Vultures. King Vultures must be up there with the most beautiful species of the vulture family, with the black and white adults much easier to pick out in the soaring throng than the all black juveniles. During the day Plumbeous and Swallow-tailed Kites again passed overhead pretty much constantly in ones and twos while resident species like Short-tailed Hawks caught some of the thermal activity. Later in the day we birded the very end of the Pan American Highway where roadsides offered us views of Bat Falcons and Roadside Hawks among the flocks of oropendolas and caciques. Another great day of raptor viewing in Panama. Day three started with a short boat ride up the Chucanaque River. Though ostensibly to search out the very localized Dusky-backed Jacamar and other glorious species like Blue Cotinga and Golden-green Woodpecker there was always plenty of raptor action to be had. Along the river we picked up a couple of new species for the trip including Gray-lined Hawk (a relatively recent split from the Gray Hawk) and Crane Hawk, a beautiful and interesting raptor noted for their long legs and double-jointed tarsal bones. The aforementioned features allow the crane hawk to hunt successfully for prey in tree cavities. Later in the day we again birded a couple of local roads where we managed to do something that would be pretty tough to do in the US: have a four kite species day. Adding Gray-headed Kite to Double-toothed, Swallow-tailed and Plumbeous. It was amazing to just have Swallow-tailed Kites flowing over most days in decent numbers in and of itself. Day four was one that will live long in my memory, an encounter with a Harpy Eagle. 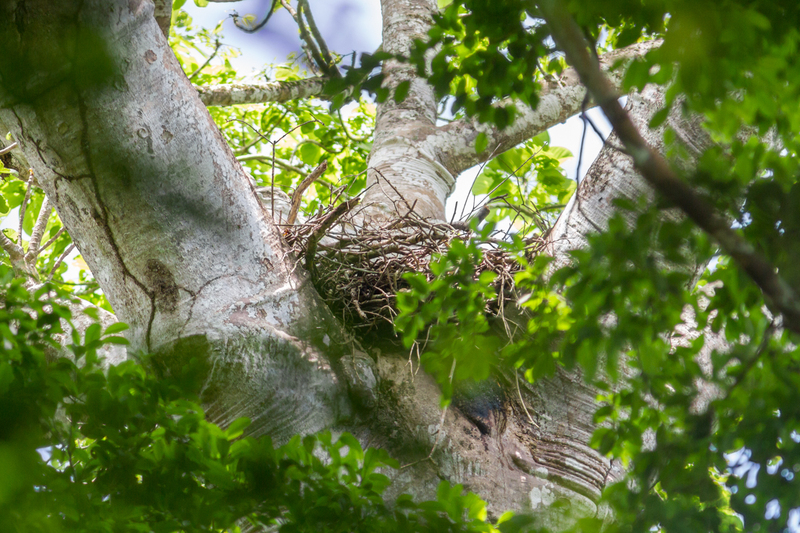 This bird had been recently discovered on a nest by a relatively nearby community and had only been seen by Carlos and our local guide thus far. It was a fair way away from where we were staying but was within the realms of possibility for a day trip. The Harpy though wasn’t our first raptor of the day as we had to travel quite a distance to get to the nest site, first by car, then by boat and follow that up with a long walk through a sauna-like jungle. Boat rides are a great way to see raptors as they perch out along the river and our dugout “cruise” netted us a bunch of nice sightings of previously encountered species. 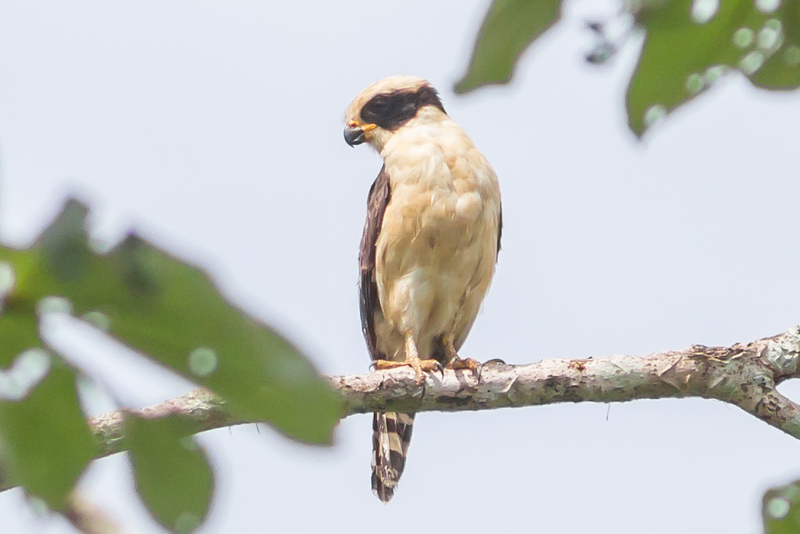 The hike started in a plantain plantation where we encountered both Laughing Falcon and Black Hawk-eagle before setting off on our long march toward the Harpy. With temperatures hovering around 85 degrees and humidity right in that ballpark as well it wasn’t long before the hike had us pretty sweaty, pretty tired and a little sore. Harpy Eagles, however, are a pretty strong motivator so we shrugged off these minor inconveniences with good humor. 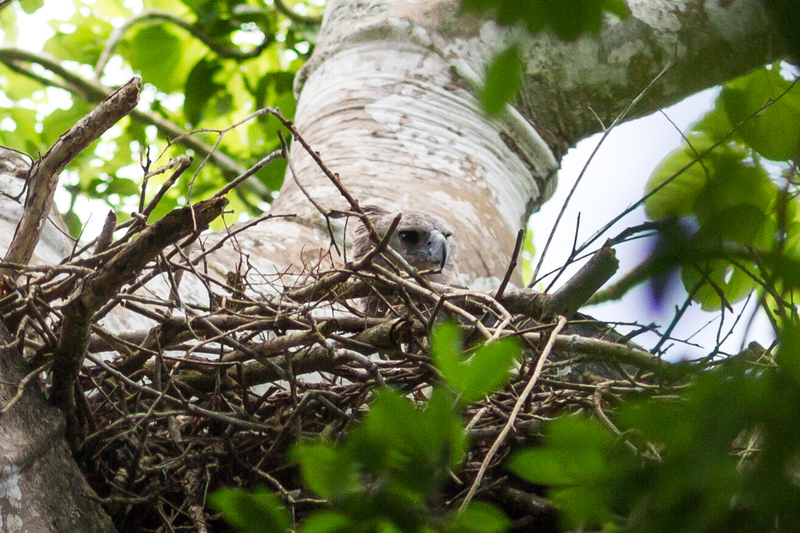 When we arrived at the nest site there was initial disappointment when nothing was visible in the nest, though that just made it all the sweeter when about fifteen minutes later there was some stirring of movement and one of the adult eagles stuck it’s head up above the parapet. We all did our best to oooh and aaaah in a respectfully hushed tone and enjoyed our wonderful scoped views from a deferential distance. After a short encounter with this magnificent bird we all hiked our way back to the boats with a definite spring in our step. This whole day was a magical one that I will have to write about more extensively another time. We had enjoyed incredible weather for our whole trip considering it was the green season (realtor like code for rainy season) but our last day did finally see some daytime rain catch up with us. That said it wasn’t heavy enough to deter the birds or us hardy birders. While drizzle doesn’t really encourage soaring raptors it did encourage a beautiful juvenile Bicolored Hawk to grab a snag-top shower in our presence on our route back to Panama City. 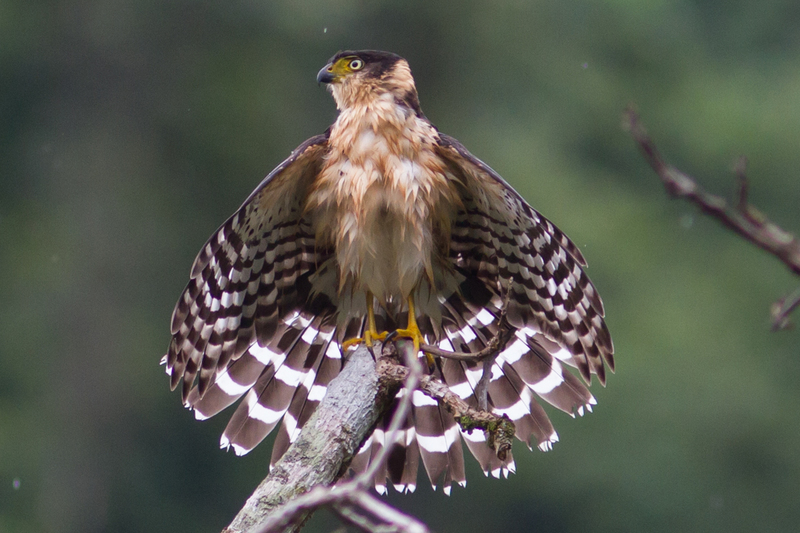 This forest accipiter is quite rare in Panama and can be quite tricky to see anywhere and even more so tricky to see well. It was in fact just the first juvenile Carlos had definitively encountered and probably the best views any of our group had ever had. Usual views of this species tend to be quick ones as they dash across a trail, but this bird sat with us for a full 20 minutes before we left him to his preening. The trip ended back in Panama City where after the heavens opened they cleared just enough in the late afternoon to allow me to view a few raptors continuing their migration or heading to their roosts for the day. My impromptu hotel parking lot hawkwatch therfore netted me both Plumbeous and Swallow-tailed Kites and at least a couple of Ospreys. My last “hawks” of my trip were a steady stream of Common Nighthawks heading for their wintering grounds at dusk. An enchanting end to a magical trip to Panama. Next year I will be back in Panama with the Hawk Migration Association of North America especially for raptor migration. The Harpy Eagle is a long shot on this tour, but the tour is just about perfectly timed if they repeat one of those two million raptor flight days over Panama City like they had in 2014. It certainly promises a more raptor focused trip with a few species that were not in the range of this tour. More on the HMANA website here. I’m also hoping I might convince Sunrise Birding to let me run their Darien trip again – more on that in the future I hope.